“The issue is that transition always involves loss, no matter how good the next phase will be. The subject of being a TCK and the loss of friendships has been a subject heavy on my heart these last few weeks. Understanding the loss a Third Culture Kid experiences is to know that the layers of loss run deep. It is not a superficial issue of just saying ‘goodbye’ but becomes a loss of identity. There is the loss of home, community, friendships, family, pets, culture, worldview, language, food, weather, expectations, etc. When you have a highly nomadic life as a TCK you lose your world over and over again every time you move. In turn with each move and each series of losses you equally cycle through stages of grief, just as you would with loss of a loved one. It is that loss that I experienced when my parents repatriated back home to the US after serving six overseas tours with the military in Europe. It took my final year of high school in the US, followed by two and a half years at University of not understanding the full scale of the loss and grief. Then at a world missions conference I found out about TCKs, that I was one, and everything started to finally make sense. It is my experience that has fueled my need to speak out for the future generations of TCKs. There are some experiences I have now as an ATCK (Adult Third Culture Kid) that prompt my need to write and to share. I am thirty years old and I have yet to live in one place for longer than three years at a time since birth. For the most part I have been around people who have led similar nomadic lifestyles with being a military child and later a military wife. People were constantly coming and going in and out of my life. Keeping in touch with friends when you moved twenty years ago (and back further) is quite different from today. You swapped mailing addresses and not emails. I believe I had my first email account in 1995 as junior high student while living in Germany. Ten years later in 2005 I started a myspace account and a year later in 2006 became active on Facebook. By this time I was living in the US, married with one child and one more on the way. When I think about how social networking has impacted our lives today, it truly is remarkable how much different it used to be. I would keep mailing addresses of friends in an ‘old school’ address book. It was not strange to mail something to a friend and have the letter later returned because they had since moved on to another location. When email started becoming popular it was normal for us in the younger genrations to change our email address. Email accounts only held so much space and there were always trendy new email servers popping up. In the end remaining friends with someone from previous moves proved very challenging as a TCK. Despite sharing a completely unique experience as a TCK, once you have moved twice that friend has now shared other life experiences and has made new friends too. 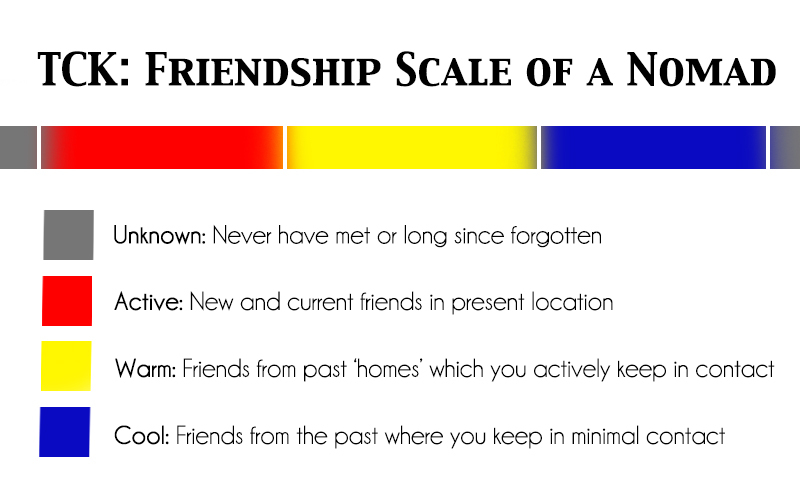 I came up with a colour diagram as a way to explain how moving frequently affects friendships. Red is the current place you live in and so your friendships there are current and active. When you move from your current location on to the next location those friends move into the yellow. The new place becomes your red hot spot. You make new friendships, you see each other frequently and you know what is going on in your day to day life with those people. The friendships you made that are now in the yellow zone have some what changed intensity. While you may still keep in close contact with the selected view, many of those you will slowly over time lose contact. Since you no longer live in the same city/country/continent the likely hood of running into each other to jump start a stale friendship is slim to none. When move again the friends from the red zone now move to the yellow, those in yellow to the blue, and it is possible that those in the blue now fade into the grey. There are always exceptions and some friends can stay in certain zones or move up and down the scale depending on the work put by both parties on the friendship. Very few friendships may ever make it out of the blue zones, now that they are two times removed. Between the time that you knew anyone in that blue zone and the new zone in your current location, you have made many more friends and have experienced many more things in life that those people have no missed out on and vice versa. Again there is always a chance for friendships to keep in tact it just takes a lot more work and friendships are a two way street. This is Pt. I, to read TCK: Saying Goodbye to Friends Pt. II click here. For more information on Third Culture Kids, TCKs, and ATCKS. 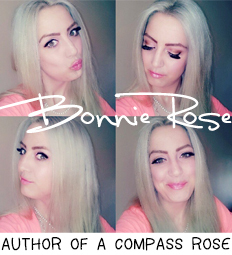 *photograph and graphic belong to Bonnie Rose Photography © 2013 All rights reserved. ** Contact bonnie[at]bonnie-rose[dot]co[dot]uk for more information regarding photographic services. I love the scale you invented! It’s sad but its so true. I want to keep all the friends I’ve made but with so many moves its impossible. I’ve had to learn to let go of all of that, the anxiety and stress of trying to keep up with everything, and it’s been a blessing. Thank you Kristin! I know I need to let go more, I just have this overwhelming sense to not let anyone down. I feel like I can be an awesome friend to anyone who needs or wants one, and I hate to be anything less. Multiply that by how many people I’ve met in my life and I see how thats not an equation that will work out. I’m an adult TCK too–and friendships–saying goodbye–dang, that’s so, so hard. My Mom once described what leaving our friends was like, and she said, “It’s like they’re plunging in the knife and they just keep twisting it!” because the pain doesn’t really go away. I’m American, but I consider my “home” Malaysia–and every single day I miss it. But it really is so common to fully lose touch with people if you move away and never go back. Still, the friendships are worth it. I found your blog through canopi! It’s nice to meet you! So glad to make friends with another TCK blogger. I am really like the Canopi site so far after two days. How are you liking it?